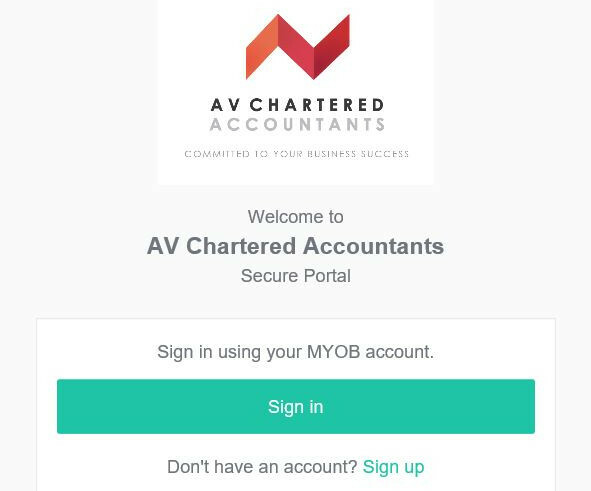 The AV Portal was developed in consultation with our IT partner MYOB to collaborate more efficiently with you on important documents such as income tax returns, signing of financial statements and resolutions. Once set up, you will be able to review and electronically sign documents and return them to us. Any document that requires a signature can be sent this way. We can also allocate tasks to you requesting information and you an upload these documents directly through our secure AV Portal.through our secure AV Portal. Like most platforms these days the AV Portal will require an email address and a password. Please note that each person needs their own separate email address to access the AV Portal. If you share an email address with your partner/spouse, please advise us immediately. The Australian Taxation Office has confirmed they will accept electronic signatures. Theyve been using them for years. You will no longer need to make trips to the post office to collect sensitive information and then scan the signed documents to us. It takes just a few moments of your time to set up your secure log in and you're away! Sadly emails are no longer secure and vital information can fall into the wrong hands. Australia Posts decision to increase postage costs and slow mail deliveries to five working days has prompted us to seek a more efficient system. Using your unique account the turnaround for documents will be much faster, more efficient and more secure than our previous methods of mail and emails. As we begin to roll out the program, you will receive an email directly from MYOB asking you to setup your account with us. If you have a Google Plus account, sign in there otherwise click on the "Don't have an account? Sign up" section and spend a few moments setting up your login details. You can access the AV Portal by clicking on the AV Portal tab in the top navigation bar and sign in with your email address and password. It's that simple. If you have any questions regarding the AV Portal please contact our office on +61 2 4929 5533.